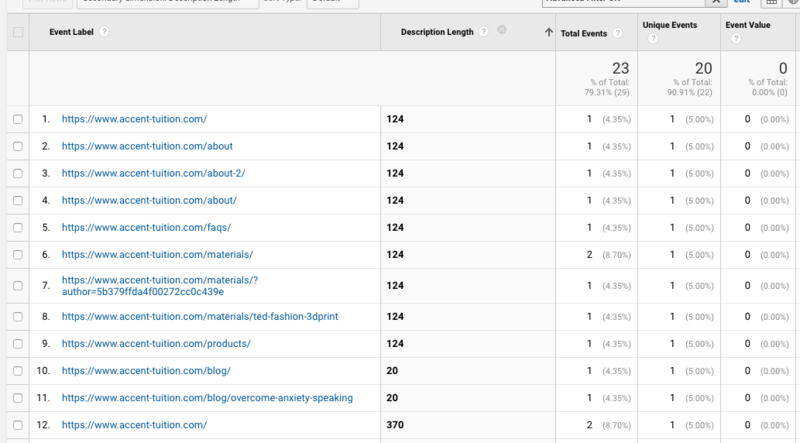 Onpage Hero turns Google Analytics into an SEO suite. Today, we are looking at how to find and optimize your meta descriptions automatically. 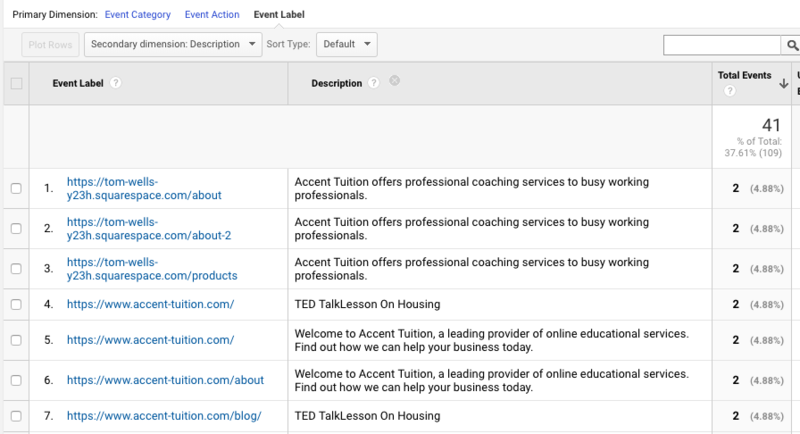 Firstly, make sure you have Description and Description Length selected as part of your Onpage Hero plan. Free plans allow you to add up to 3 data points, whereas paid plans allow up to 20. The options on the left show the datapoints applied to this property. 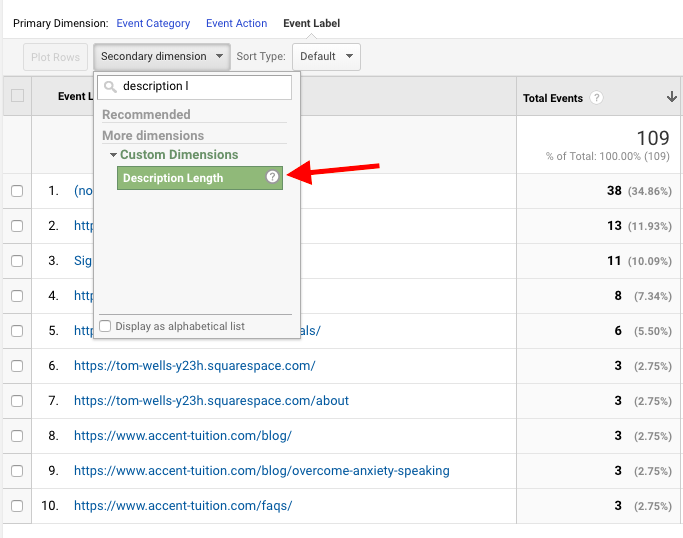 Select the dimensions Description and Description Length, click NEXT, then VIEW ANALYTICS to jump into your Google Analytics property. Meta descriptions are found <meta name=”description”> part of your site’s source code. 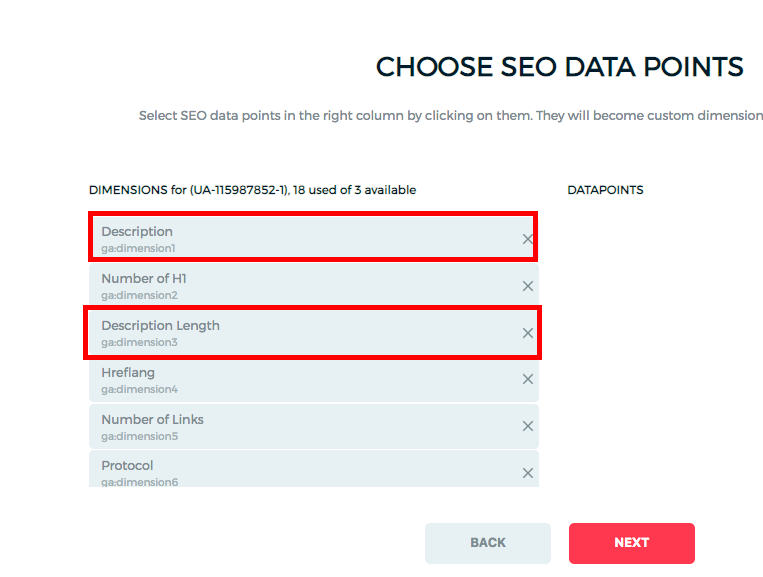 Description is a custom dimension in Onpage Hero that allows you to see the meta description text of a particular page in GooAnalyticsytis. This is useful if you have a large number of pages and you want to analyze at a glance and then optimize your meta descriptions accordingly. Meta descriptions help search engines understand the content of your page when indexing. Also, they display in search results pages and on social media sites when content is shared. They need to be optimized for SEO purposes as well as to create a great user experience. Give each page a unique meta description – avoid duplicate meta descriptions as Google penalizes duplicate content. Make your meta descriptions highly descriptive. Focus on what your users would want to click on. Avoid keyword stuffing. Google may reject it which is not cool. Use the active voice to be more engaging. Description Length is a custom dimension in Onpage Hero that shows you how long a meta description is per page. The number displayed is the number of characters. Why is meta description length important? A page with a very short (<50 characters) meta description may be regarded as suspicious or low quality. On the other hand, If your description is too long, it will be cut off and not displayed correctly. We recommend writing a description between 50 and 160 characters. There is no standard number of characters that Google displays, however, they should mean your description is displayed correctly most if not all the time. Ok, let’s take a look at our meta descriptions first. So type “meta description” as a secondary dimension to display the results. From the results, we can see that one description is well over the recommended 160 character limit. Also, some descriptions have the same number of characters which implies they may be duplicated. To speed up your workflow, Onpage Hero has created a useful Google Data Studio custom report where you can display meta description text and length side-by-side. Head over to our dashboards page and get the Title and Descriptions report. 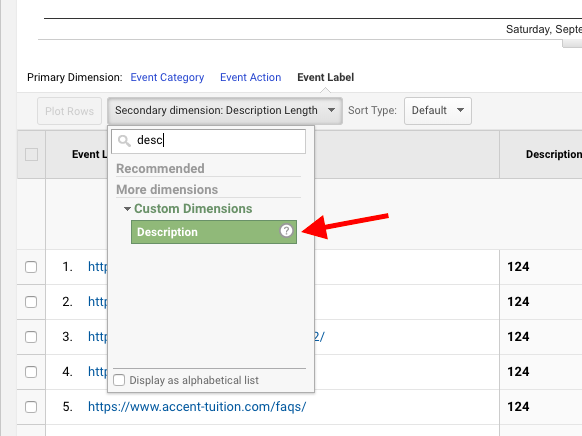 Use the Onpage Hero custom dimensions Description and Description Length to optimize your meta descriptions on your website. Speed up your workflow by using a custom dashboard.